My wife and I just spent two weeks traveling the Colorado Plateau, that astonishing five million year-old uplifting of sedimentary rock that makes Southern Utah and Northern Arizona (as well as parts of Colorado, and New Mexico) so amazingly unique. We toured some of the National and Tribal parks that dot red sandstone country: Zion, Bryce, Arches, Mesa Verde, Monument Valley and the Grand Canyon. Those of you who have been there know words are inadequate to describe the awesome natural beauty of the high desert plateau with its myriad canyons, arches, windows and hoodoos. 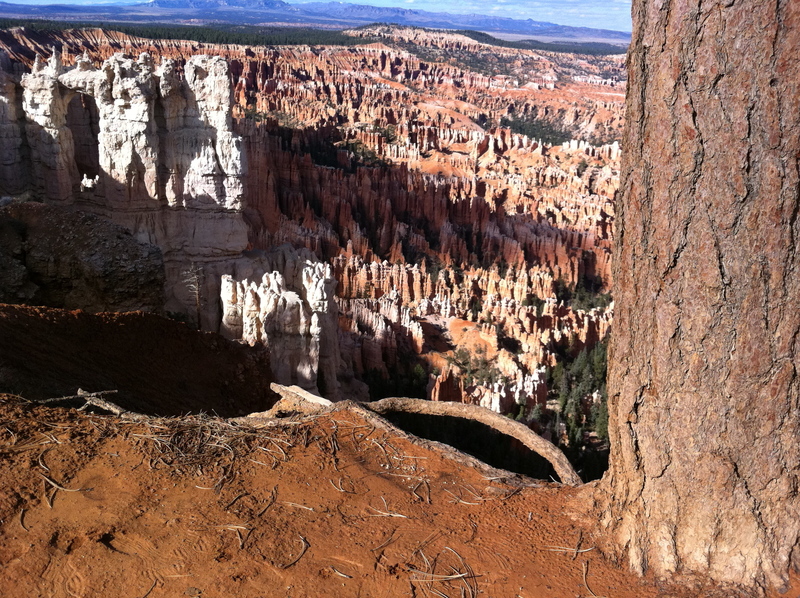 A few days into our journey my wife and I decided to trek down into the Bryce Canyon amphitheater to get a closer view of the erosion-formed hoodoos at its bottom. As we started snaking down the switchbacks that led to the canyon floor I became aware, for the first time in my life, of an overwhelming fear of heights. 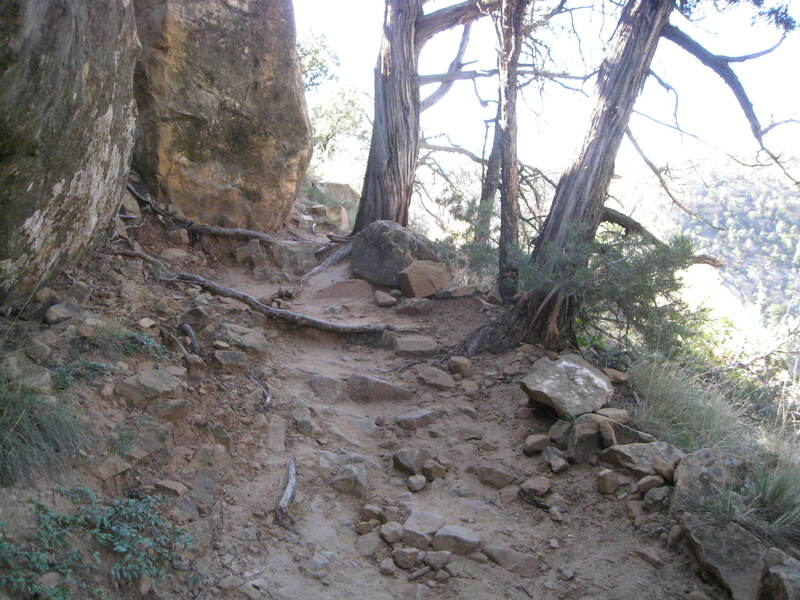 I was terrified of the closeness of the trail rim and the precipitous drop that lay to my right. My knees weakened and when I couldn’t see around a narrow stretch of switchback I became fearful I’d trip and fall, and refused go any further. I apologized to my wife, who was enjoying the descent, and told her I had to turn back. Now if you look objectively at me beginning down that trail (see below) you’ll see the trail is really fairly wide, but that I am nevertheless clinging to the left side of the trail where there’s a high wall and no drop off. If I’d tripped and stumbled there’s no way I’d have plunged to my death. I’d have skinned my knees at the worst. I was suffering from a sudden case of acrophobia. I was mystified! Climbing up ladders or doing housework on the roof had never been my favorite activity, but I’d always been able to do it. Young children were hiking that trail without any difficulty, for heaven’s sake! I felt thoroughly ashamed! This event reminded me of another time in my life when I’d experienced significant irrational fear. I was on my second ten-day meditation retreat at the Insight Meditation Society (IMS) in Barre, Massachusetts. My first retreat had been heavenly bliss, so naturally I expected my second to be a repeat of my first. Oh, dread beginner’s naiveté! Beware of expectations! They always come back and bite you! A few days into the retreat I developed a paranoid fantasy about one of the other yogis, an eccentric individual who kept showing up at the outdoor spots I’d picked for my walking meditation. Only he wasn’t doing walking meditation. He was doing his own thing. He’d stand motionless for ten minutes, then take off running towards me at full speed, then suddenly stop a few feet in front of me resuming his previous stillness. I was baffled and unnerved, and began thinking that his intentions were malevolent. Perhaps he was a serial killer and he’d selected me as his next victim? He seemed to be everywhere. I’d go for a walk around the loop of roads circling IMS after lunch and hear someone clearing his throat behind me. I’d turn around, and there he was! My paranoia intensified. I was wearing a baseball cap with the name of my daughter’s college written on it. What a mistake! After he killed me, he could go after her! A part of me recognized that this thinking was seriously disturbed and I tried using logic to derail it, but to no avail. Another part of me thought that my meditation had made me super-sensitive and that I could read his energy or thought waves. I wasn’t being paranoid, I was just tapping into his aura! This paranoid episode lasted for several days, and I was thoroughly miserable. Then one evening one of the teachers at the retreat gave a talk about fear. How perfect! How excellent! How well timed! When the pupil is ready, the teaching appears! The teacher, Michael Liebenson Grady, discussed his own fear of unleashed dogs on the loop around IMS. Once when confronted by a growling dog, he recalled the tale of how Ajahn Maha Boowa recited metta verses to a tiger he encountered during his nightly walking meditation. Maha Boowa had escaped unscathed. Michael decided to try the same method on the dog by reciting the metta verse “May you be happy!” The dog bit him. Michael quipped that perhaps that was what made the dog happy! On a more serious note, Michael went on to say that the only way out of fear is through it. Instead of trying to argue the fear away, he suggested being mindful of the physical sensations and fear-generating thoughts, just watching them without any effort to change them. That evening I tried Michael’s suggestion, and the fear magically dissolved and melted away. It became completely insubstantial. I was amazed! I was at ease with my would-be serial killer for the rest of the retreat and saw him as just a harmless eccentric. The retreat ended with yogis being invited to share parting comments. One older woman singled out my killer for praise, commenting on his great kindness to her during the retreat. 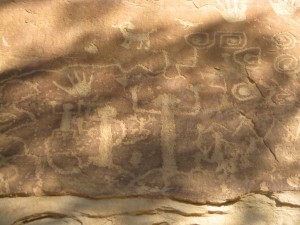 Several days later on the Colorado Plateau my wife and I went on a hike to see the petroglyphs that an ancient Puebloan had inscribed on one of the sandstone bluffs at Mesa Verde. 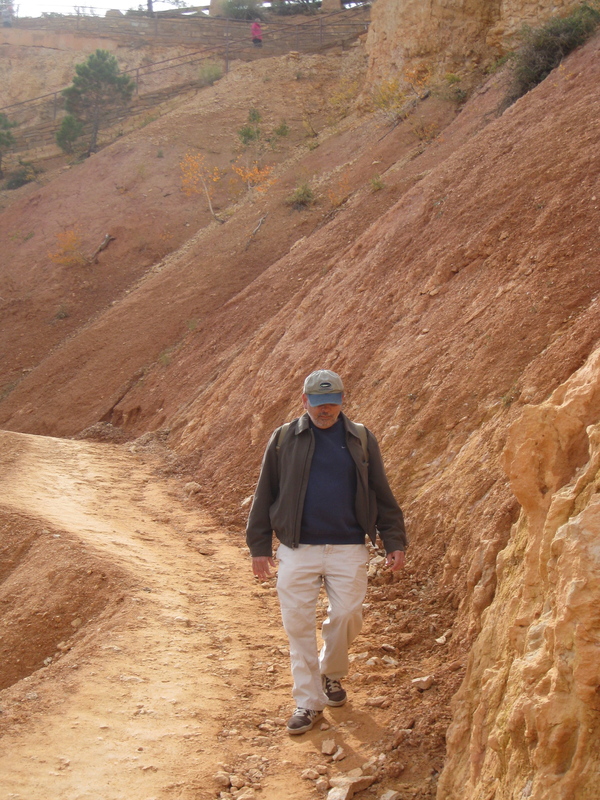 Our trail guide rated the hike as “easy.” About fifteen minutes into the hike, however, the narrow trail began following the canyon rim with a precipitous drop off to my right. Once again my knees weakened and I began to feel the fear I’d experienced at Bryce Canyon. There was even one point when the trail went up 90 degrees over sheer rock. One had to put one’s right foot onto a toe-hold off to one’s left and then pull oneself up the rock. It was worse than Bryce! They had to be kidding! This time I was going to go about things differently, however. I mindfully noticed the weakness in my knees as sheer sensation, and my thoughts of falling as just thoughts. I also did some stimulus avoidance, trying to keep my eyes straight ahead and slightly to the left to avoid staring into the abyss off to my right. Once in a while, however, when the trail widened a bit, I’d sneak a peak and appreciate the grand vista off to my right from a safe distance. Behavior therapists say that exposure is the best cure for phobias, but the exposure has to be lengthy for it to work. 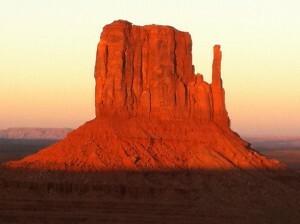 I guess the two-hour petroglyph hike was long enough for exposure to work some of its magic. 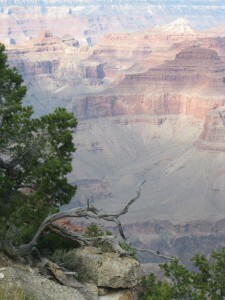 A few days later my wife and I walked part of the rim trail around Grand Canyon. I was able to walk it comfortably, although I didn’t walk as close to the edge as my wife did. There were some intrepid teenagers walking the same trail who stood on the rocks and ledges on the canyon’s edge posing for pictures, fearless as mountain goats. How I envied their courage! I wasn’t totally over my new-found phobia, but it remained manageable, and I enjoyed the hike. So here’s a recipe for coping with fear: One part mindfulness, one part exposure. Instead of believing the fear-talk, see it as mere thinking. Notice the weakness in your knees as mere sensation. Don’t get caught up in being fearful of the sensations and believing the thoughts. (“Oh, no! My knees really will buckle and I’ll tumble into the abyss!”) Don’t try to make the fear go away, but just mindfully observe it in all its manifestations. Mindfulness is itself a form of exposure: one accepts and explores the fear rather than pushing it away. Lastly, do the thing you fear, don’t avoid it. Expose yourself to it for a sufficiently long time (at least ninety minutes!) without avoidance. I cheated a bit by avoiding looking to the right when I was climbing the Mesa Verde petroglyph trail. But I was only cheating myself. Who knows? If I’d forced myself to look I might have become one of those courageous teenage mountain goats posing on the Grand Canyon ledge!